I came across this recipe quite by accident, but it was quite a happy accident if I do say so myself. I had some spicy italian sausage I wanted to use up, and soup seemed like a logical way to do it. I am a soup fanatic. 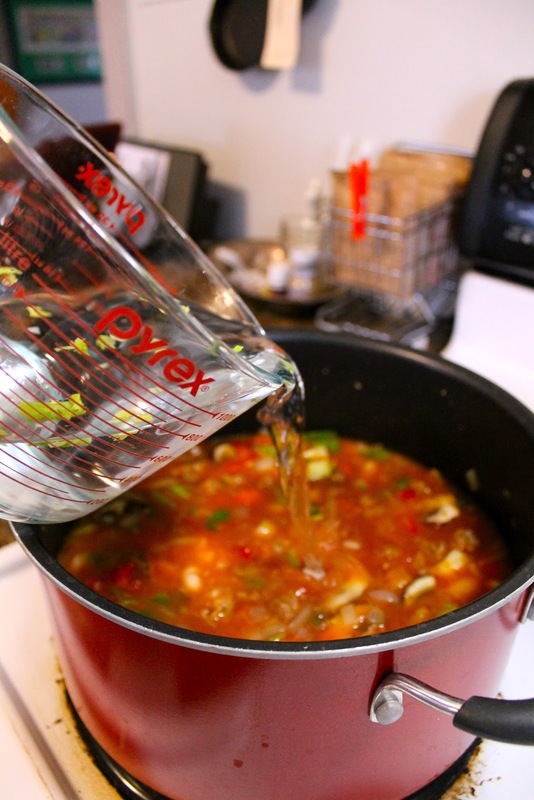 If you love soup, you are sure to love this recipe. It's got a bit of spice and is easily modified. If you are in the mood for a soup full of veggies, this can handle it, and if you aren't, well, that's okay too! Start with three spicy italian sausages, casings removed. I don't use any olive oil because the sausages have plenty of fat in them. Break them up with a spatula as you cook them. I've got 2 cloves of garlic, one celery heart, 2 carrots, 1 onion, and 4 mushrooms. I also have a cup of bell peppers that I pulled out of my freezer--remember back in the summer when we froze them in season? Yep, I'm still using them! 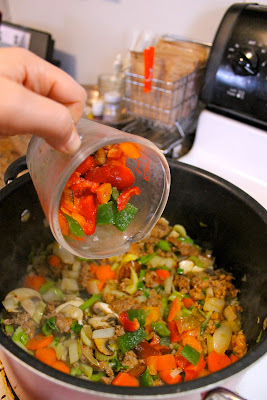 When the sausage is browned, throw your veggies in the pot. Once your veggies have cooked down a bit, you'll want to throw in your peppers. Now we're gonna get soupy! I'm adding in 1 quart of tomatoes, with the juice. If you are buying them in the store, go for the diced. I also have a a pint of my chicken foot stock. You can substitute 2 cups of any stock you fancy, of course! A cup of cannellini beans, which are already cooked. I know a lot of you will used canned beans, and that it totally cool. I'm not looking. Now bring it all to a boil. Then reduce the heat, cover and simmer. You want to let this simmer at least 40 minutes, at that point you will want to give it a taste and adjust the some seasonings. Salt, pepper, and even a dash of cayenne if you desire a bit of a kick. After that you can let it continue to simmer covered until you are ready to serve it. If you want to let it sit in teh refrigerator overnight and serve it the next day, that works too...as the saying goes, soup is better the next day! I served mine with a nice salad and some bread! 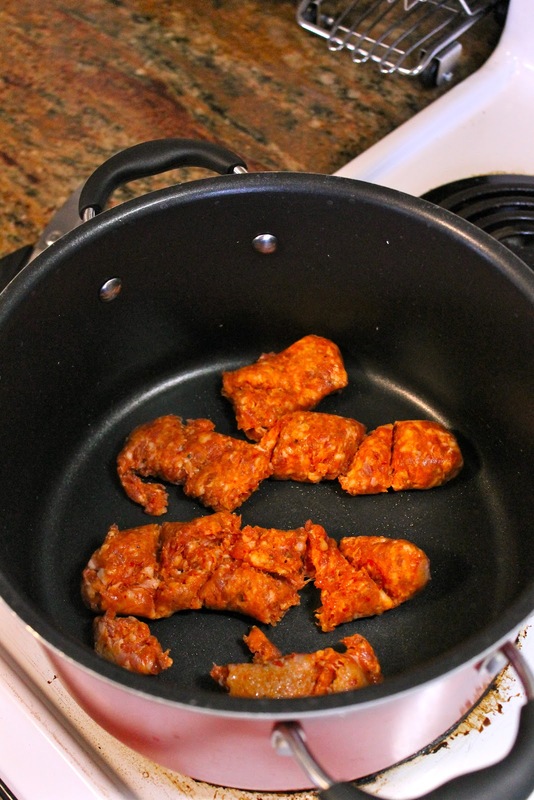 In your soup pot, over medium high heat, cook your sausage for 5-7 minutes or until browned. While it is cooking, use a spatula to break it into smaller, crumbled pieces. While the meat is cooking, you can slice your vegetables if you haven't already. 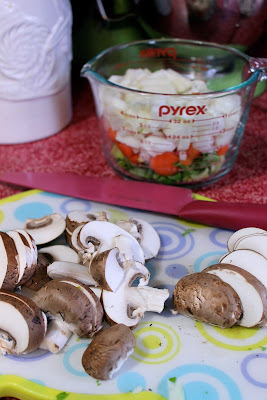 When the meat is browned, add your vegetables (celery, mushrooms, carrot, onion, and garlic) to the pot. Cook and stir until the onions are becoming translucent, about 5-6 minutes. Add your peppers, tomatoes (with juice), chicken stock, beans, and water. Once it's boiling, reduce the heat, cover and simmer for 40 minutes. After the 40 minutes, taste and add a bit of salt and pepper and even some cayenne if you please. You can allow it to continue cooking for a couple of hours on low heat (covered) until you are ready to serve, or you can even refrigerate it overnight and reheat the next day.